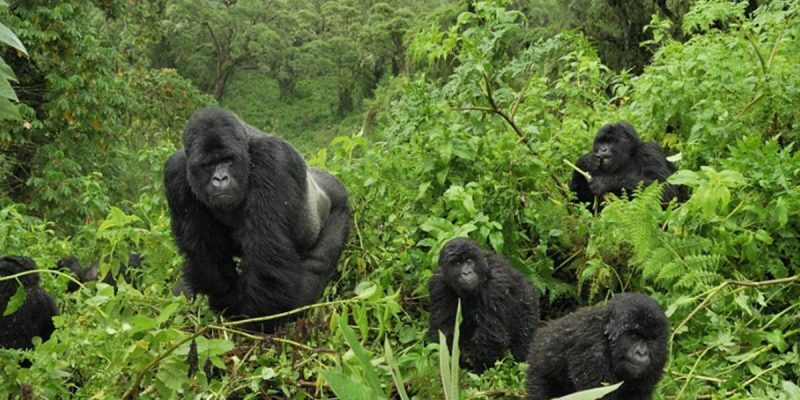 Set at an altitude of 1,160m – 2,607m above sea level, Bwindi Impenetrable Forest National Park a UNESCO world heritage site is home to over 400 mountain gorillas, almost half of the world’s remaining gorillas. Bwindi Impenetrable Forest is Uganda’s tourism gold mine attracting in most visitors that come to see the endangered mountain gorillas with 12 gorilla families and 8 habituated and the other 3 gorilla groups available for gorilla habituation experience. The Bwindi jungle is also a bird-watcher’s paradise with 350 species recorded, including many Albertine Rift endemics. The Impenetrable Forest Reserve was gazetted in 1942, upgraded to the Bwindi Impenetrable Forest National Park in 1992 and recognised as a World Heritage Site in 1994. in the local Rukiga language, Bwindi actually means ‘Impenetrable.’ This double warning is apt, for Bwindi is all but impenetrable; 327km2 of tangled vegetation draped over a deeply fissured landscape of steep, slippery valleys and high, draughty ridges. But if the terrain is far from easy to negotiate, it is well worth the effort. A trek through this, one of Africa’s most ancient rainforests, in search of the endangered Mountain Gorillas, ranks among the world’s premier wildlife encounters. Bwindi Impenetrable Forest can be cold especially in the morning and at night with the coldest period being June and July. Warm clothing is required plus wet weather gear since Bwindi recieves up to 2390mm of rain/year. This is concentrated during two wet seasons, short rains in March-May and heavy rains in September-November. Instead of short tropical deluges, rain in Bwindi often falls as long hours of soft drizzle. Bwindi has a population of over 400 gorillas of which an estimated 116 are habituated. Gorillas are intelligent, majestic, gentle giants that share over 90% of their genetic material with humans. All of Bwindi’s habituated gorillas are known individually by the rangers and have been given names in order to identify them. The males can weigh more than 500lb and some silverbacks exceed 6ft tall. There are least 120 mammal species living in the forest, making Bwindi second only in mammal numbers to the vast Queen Elizabeth National Park. The eleven primate species found here include: black-and-white colobus and L’Hoest’s monkeys, baboons and chimps.forest elephants and several species of antelopes. Of Bwindi’s 200 butterfly species, 42 are endemic to the Albertine Rift. Bwindi offers some of the finest montane forest bird watching in Africa, and is an unmissable destination for any birder visiting Uganda. There are an estimated 350 bird species with 23 endemic to the Albertine Rift and 14 recorded nowhere else in Uganda. Globally threatened species such as African Green Broadbill and Shelley’s Crimsonwing are also found here. Other birds include the Handsome Francolin; Black-billed Turaco; African Broadbill; Black and Cinnamon-chested Bee-eaters; Western Green Tinkerbird; Purple-breasted, Blue-headed and Regal Sunbirds; Short-tailed nd Black-faced Rufous Warblers; Mountain-masked and Collared Apalis; Mountain and Yellow-streaked Greenbuls; and Many-colored Bush-Shrike, among others.